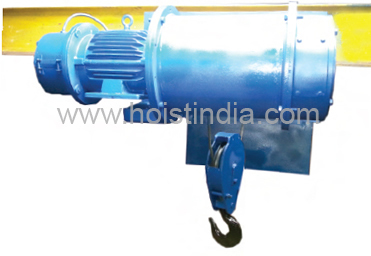 Hoist-o-hind is a renowned manufacturer of hoists with a wide range of lifting capacity varying from 0.25 tons to 50 tons. All Hoists are confirmed to class II duty as laid down in IS 3938/1983. 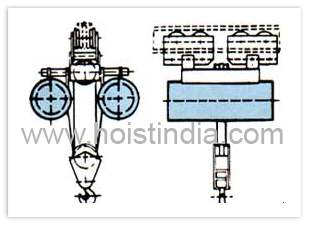 Hoists confirming to class IV as per IS 3938/1983 also can be supplied on request. 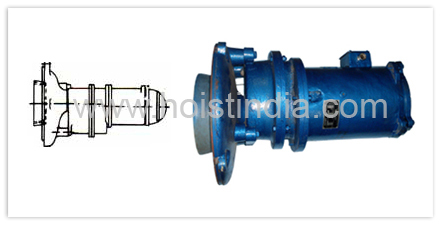 Manufactured in ISO 9001:2000 Certified Company Assured quality and Interchangeability of parts. Easily Accessible separate brake, motor, drum gear box and panel unit. Unique and Sturdy rope guide arrangement Prevents rope slackening and easy change rope. Precision CNC Machine Cut Case-Hardened Alloy Steal gears Noiseless Operation Longlife. Fail Safe Electro magnitic Brake.Trouble free operation and ease of adjustment. Heavy Duty Class IV Robust Design Smooth operation even in toughest of application. Special <Quick Brake> adjusting system takes only few minutes to adjust thus reducing the down time. Hoist motors are designed for 'F' class insulation which is superior to class 'A' 'E' and 'B' types of insulations. The motor (10) is three phases squirrel cage, conical rotor type working on 440 volts. 50 c/sec. A.C. supply. This motor is specially designed for hoist and crane and is insulated by class ‘F' type of insulation according to B.S. : 2613. The starting and stalling torques of this motor are 220% and 290% of the full load torque. The motor is rated at 40% ED. 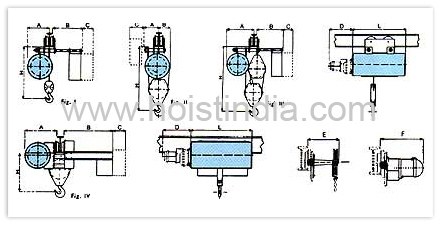 The axial movement of the rotor is one of the characteristics of the conical rotor type of motor. This characteristic is taken advantage of in the actuation of the brake. When the motor is started the rotor (11) is axially pulled into the magnetic centre of the stator and the brake is released. As soon as the current is cut off the brake spring (9) presses the brake disc (12) against the cover and the brake is applied. The braking torque is 100% above the motor torque at the rated load. The maintenance and adjustment of the brake us very simple due to <Quickbrake> system and can be done without removing any part. The brake disc and brake end cover (3) are both made of high grade cast iron and the brake lining is of ‘Ferrodo' type. The gear box (2) is made out of high grade cast iron. The precision spur gears (4) are machined from alloy steel and are fitted with ball/needle roller bearings. The gear box is filled with grease. The rope drum (5) is rolled welded and precision machined. This rope drum is supported on large diameter roller bearings (6) on both ends and the drive is through internal gears. The ample drum diameter ensures the best possible working condition for the wire rope. The rope guide (7) is made of high grade cast iron. The rope tightener (8) is built-in in the rope guide itself. This rope guide moves on the drum like a nut and prevents the rope from overriding and loosening. 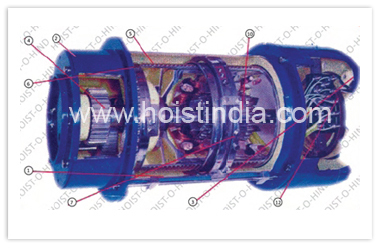 All hoist parts are enclosed in the main housing (1) thus forming a better looking integral unit. The main housing like the rope drum is also of rolled and welded construction, equipped with mounting bracket. Every hoist is provide with built-in limit switches (16) to control the top and bottom position of the hook. Tappets (13 & 15) can be adjusted to any position in between the range provided. These limit switches are actuated by the rope guide. The hoist is controlled by a pendant push button station. Supply to the pendent push button is of 110 volts as per IS specification. All hoists can be fitted with a micro speed attachment which reduces the hoisting speed to 1/10 th of the main hoisting speed. The micro speed attachment works independent of the load and main hoist. There is a separate control for the micro speed. This arrangement is invaluable in the handling of bulky, heavy and delicate loads. Every hoist unit before dispatch is tested at 125% of the rated load capacity on single fall of rope. Only after all the components pass the rigorous inspection tests, the hoist is approved for dispatch. These are available in all types of mountings. E.g. floor mounted, ceiling mounted, wall mounted etc. They use for loading and unloading transportation vehicles, through floor hatches or outside the wall, and for serving production machinery. 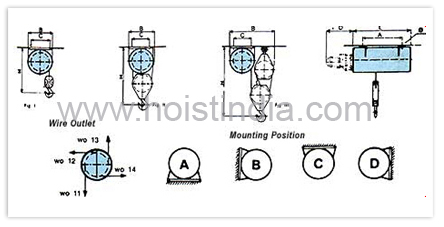 When ordering, please state in what position the hoist is to be mounted and wire (WO) required. 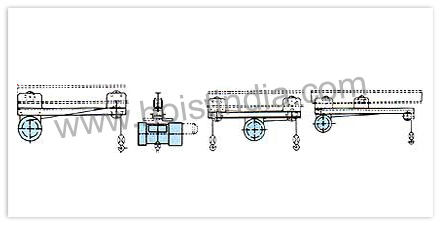 Hoists can be equipped with trolley for horizontal traveling. The trolley is fabricated from components bolted and welded together and carried by traveling wheels supported on ball bearings. Smaller loads can be moved with a push type trolley whilst the hand chain or motor driven should be used for heavier loads. The drive motor is of squirrel cage type with built-in brake. The motor drives one or more of the trolley wheel's gear rim. Wherever there are limitations to the available head room (dimension H), short head room trolley can be supplied (refer figure IV above). Where the trolley has to negotiate a cured track, or the material movement is from one bay to another, this type of arrangement fulfils the requirement. The minimum radius of curvature the flexible trolley can negotiate is 1.5 meters. These are particularly required when the load is bulky or for handling material from furnaces / chemical baths. This trolley can also be provided with two hooks to deal with loads like paper rolls, logs etc. When the loads go beyond the overhead track, an outrigger type extended trolley is indispensable. These are used for loading on and unloading form ships in stream. Driver's cabins can also be built with the trolley. For exceptionally high heights of lofts this arrangement is very useful. It also the option of two hoisting speeds. The maximum height of lift is 73 m for a load of 5 tonnes, for 228 twin hoists. This attachment when fitted to the hoist can provide 1/10 th of the hoisting speed of main host independent of there load. A separate push button interlocked with the main host push button controls the attachment. Thus either of the two can be operated at a time.